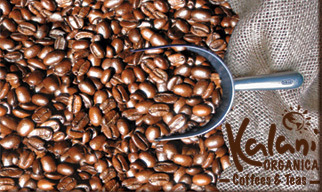 with a commitment to providing high quality, freshly roasted coffee. Integrity from the farm to the cup. At Kalani , we hand roast, import and distribute only organically certified coffees and teas. Organic growers have made a commitment not to use synthetic pesticides, herbicides and fertilizers. In addition, they practice sustainable agriculture and natural soil-building. The impact of this is far-reaching. It means cleaner watersheds, the creation of habitat for birds and animals, safer conditions for field workers, equitable pay for their labor and a chemical-free product for your enjoyment. All of Kalani's coffee beans are Coffea arabica, the premier species of the coffee plant, thriving in the mist and cooler temperatures found in the tropics at altitudes above 1000 meters. Coffee has been traditionally grown as a shade crop, and it is in the shade the plant grows best. Organic coffees are typically shade grown, providing a more complete ecosystem which encourages natural cycles of predation and fertilization. Shade Grown Coffee is coffee planted under a canopy of sun filtering shade trees, which usually is a multi-storied mix of native hardwoods, fruit trees, and leguminous trees. This complex ecosysten provides an economic buffer to the farmer and a boost to the environment by the addition of a natural soil amendment, conserving water and top soil with a mulch cover. This ecosystem is home to half the plant and animal species on the planet. Hummingbirds, swallows, orioles and are a few of the migratory birds that find a safe haven in coffee trees in the tropics. The Smithsonian Migratory Bird Center has documented sightings of up to 150 different bird species in a shaded coffee farm compared to an unshaded coffee farm of 5 to 20. Conventional coffee plantations are a toxic environment where plants, berries, and insects eaten by birds may be saturated with posions. Due to the lack of tropical rainforests, shade grown plantation practices have become increasingly important in providing a secondary home for migratory birds. The declining populations of migratory birds in the U.S. and in your back garden in the spring is a direct correlation of the lack of shade grown coffee farms and deforestation. All of Kalani coffees are Certified Organic with the ammendment of Shade Grown as a requirement in the Certification. Shade Grown / " bird friendly "
*****out of stock****** Our unique blend of African and Central American coffees creates the ancient Berber style coffee: deep, rich body, aromatic flavors with a clean finish. Full presence and great balance in the cup characterize this premium blend. Central American coffees provide a base of sparkling acidity complimented by full bodied aromatic indonesian. Our roast is the darkest, most intense Kalani roast. This blend produces a cup rich and smooth, with medium body and pungent aroma. Our classic Italian roast. This full flavored blend combines a light, sparkling acidity with a sweet, nutty finish. Kalani 's finest high-grown Central American beans contribute dimension and brightness; the addition of our sweet, smoky French Roast creates a rich and complex cup. This blend of Central Americans shows the overall lightness and snappy acidity, typical of coffees from this region. A clean finish, preceded by a delicate nutty and fruity aroma makes for a distinctive cup one can drink every day. Grown in remote mountainous regions of New Guinea and Mexico, this blend offers a velvety smooth Java-like cup with a hint of a nutty, chocolate finish. This balanced blend of Nicaragua and Honduras coffee creates a smooth finish. An elegant cup of coffee. A spirited combination of our high grown Central Americans with our classic Espresso Blend gives this cup a harmonious, smooth taste with a deep, rich finish. Waiting for new crop... This high grown Central American bean displays clear, balanced acidity combined with a delicate, fruity aroma. It possesses a lively, medium body. The first Certified Organic coffee from Africa and one of the oldest & finest coffees in the world. The classic characteristics: Rich, full bodied, exotic flavors with a lingering finish are offered in this classic cup. The classic of Indonesian coffees, our Sumatra presents thick, earthy aromas over full body, complemented by an exquisitely lingering, chocolaty finish. We are temporarily out of New Guinea.... Grown in the central highlands of Papua, New Guinea, this coffee presents a balanced, full body with a deep, rich, Java-like flavor. Our New Guinea makes a great treat for guests, but is smooth enough to enjoy everyday. The Swiss Water Process removes upwards of 97% of the caffeine from this fine Central American, without the use of chemical solvents. Our Swiss Water Decaff brews up light and sweet in the cup, perfect any time of day. Shouldn't the caffeine-free coffee you choose also be chemical-free? kalani decaffeinates using The Swiss Water Process. This is a method of caffeine extraction which uses only pure water to extract the coffee's caffeine. What is left behind is a coffee which is more than 97% caffeine-free, yet possesses the full, rich flavor you expect from us. For optimum freshness, we recommend that you purchase your coffee every week or two, and grind it just before brewing. We will grind to specification, and this is great if one plans on drinking this coffee in the following week. Keep it tightly closed by rolling down the top of the bag or transfer it to an airtight glass container. For longer periods, the freezer is an option, if one only defrosts once! Whole bean preferred! We will be happy to set up a regular shipment schedule which ensures that fresh roasted coffee arrives on your doorstep as often as you would like (see order form).